Onion! For you junkies who picked Onion as the surprise second flavor of Ka-me Rice Crunch Crackers that I picked up the other day, give yourselves some imaginary and insubstantial JSFR points. 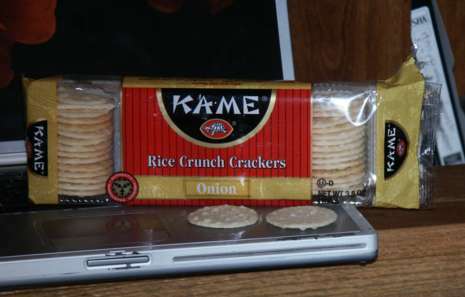 That leaves Unsalted and Seaweed to close out the Ka-me Rice Crunch Cracker family. I am not linking in the RCC family because I’m too lazy to cut and paste and because I’m writing this before Cheese Crunch Crackers go live. I’m also way too lazy to figure out the linking pattern for something that doesn’t exist yet on the internets and for which I can’t just go to and cut and paste. And as I just finished explaining above, I am too lazy to do that anyway. If you are getting your unders in a bunch over my extreme apathy, just pop to last week where I linked them all in. Wala! Now, Onward to Onion! Woah. If I never found the missing RCC siblings, I think I would be perfectly content having ended on Onion. I’m sure Seaweed and Unsalted are very good but they would have to be epiphatastic to top Onion. Onion rocks. Onion has the delightful RCC crispity crunch (pea points!) as well as a bold boss onion salty. You not only get a good salty fix but the onion comes through both on the tongue and up in the sinuses where flavors sometimes go. Good if that flavor is onion, sort of distressing if it’s wasabi. of 4.5 Wasabi Peas out of a possible 5.